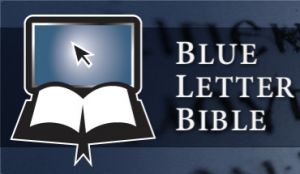 Blue Letter Bible is a ministry that provides powerful Bible study software online for free. What used to cost pastors a fortune is now accessible to the common man by simply visiting this site. If you are interested in supporting pastors and teachers in a powerful way across the world, you might want to look into supporting Blue Letter Bible. It’s a tool that’s easy enough for all of us to use. The Blue Letter Bible website provides a tool to search the entire Bible for a word, phrase or reference. You can use this tool to simply read the text, but where it really shines is when you decide to study it. Once you find the text you are looking for, you can easily switch between Bible versions. There are 14 English versions to choose from, but for the serious student, it also provides access to the original Greek and Hebrew versions. If you decide to do word studies, a single click exposes all of the Strong’s numbers right there on the screen. Should you dare to click on one of those numbers, you automatically look up the word in the lexicon. It doesn’t stop there. Unlike a book, you can view the vines dictionary entry for the word, the Strong’s definition and the Thayer’s Greek Lexicon entry. To top it all off, you can actually listen to the word’s pronunciation! The site currently provides access to 10 Bible dictionaries and provides a searching tool for those as well. When you are looking at a specific verse of the Bible, the Blue Letter Bible, provides a “Tools” button to the left of each verse. When you click on that button it immediately shows you the original language, translated right in front of your eyes, in the interlinear tab. The “Bibles” tab shows you all 10 versions of that verse one after another. The “cross-refs” tab give you a single click method of looking that verse up automatically in the “Treasury of Scripture Knowledge.” The “Commentaries” tab, indexes that verse to where it was mentioned in the commentaries. One of my favorite tools is on the commentaries tab. On this tab you will find the audio commentaries in both English and Spanish! If you click these links, you can stream or download the audio immediately. Blue Letter Bible doesn’t just give you a tool and leave you to yourself. They also provide video training right there on the website. There are 36 short videos that show you how to use the features. The site also provides maps, devotionals, bible reading programs and even an online theological school called the BLB Institute. I hope to write about that in a separate article. One of the most exciting things about Blue Letter Bible is their reach. This tool is supporting people in over 200 countries. You can look at who is using Blue Letter Bible right now on this map. It is likely that many of these people would not be able to afford these resources if they weren’t being made available by donations.